(Nanowerk News) When storing data, conventional techniques are increasingly reaching their limits. So-called single molecule magnets could provide a remedy. 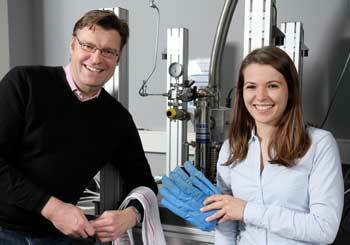 Research teams from Kaiserslautern and Karlsruhe are investigating their storage properties. The focus lies on metals within molecules, which are responsible for the magnetic characteristics and thus for storage properties. Using a novel method, the teams have now succeeded for the first time in examining these materials in greater detail. Similar to slow motion, details can now be analysed in a complementary way in order to find out more about their storage capacity. The study was published in the journal Angewandte Chemie ("161Dy Time-Domain Synchrotron Mössbauer Spectroscopy for Investigating Single-Molecule Magnets Incorporating Dy Ions"). "Single molecule magnets consist of a metal centre that is connected to so-called organic ligands and thus form a molecule," said Scherthan, the first author of the current study. "Only certain metals are suitable for this type of molecules. These include iron, for example, but also less well-known chemical elements from the lanthanide group, such as the dysprosium with which we work." They are also known as rare earth elements. The special thing about them: Their electrons can generate a magnetic moment that is relatively large for a molecule. The Kaiserslautern research team and the research group led by chemist Professor Annie K. Powell from the Karlsruhe Institute of Technology (KIT) are investigating the storage capacity of this kind of single molecule magnets and how it can be improved. In addition, this spectroscopic method provides a more detailed view of the atomic cosmos. This technique allows researchers to draw conclusions about the interactions between the metal nucleus and ligands.